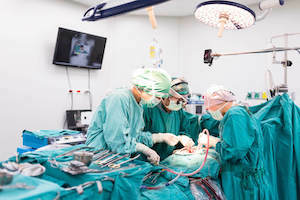 A surgical error is any preventable mistake that a surgeon makes during surgery and, as such, they are a major cause of medical malpractice lawsuits. Experts estimate that surgeons commit over 4,000 preventable mistakes every year, which cost the medical industry more than $1.3 billion in malpractice payouts. Surgical errors can result in very serious injuries and even, in some cases, death. Whenever a surgeon commits medical malpractice, you need a skilled attorney to represent you and work towards recovering compensation for damages incurred. The attorneys at Slappey & Sadd have extensive experience representing victims of medical malpractice, including surgical errors, and will vigorously protect your interests in the event that you are injured on the operating table. Operate on the wrong body part 20 times per week. As these numbers demonstrate, surgical errors are not uncommon occurrences, and they represent a significant risk for any patient who must undergo surgery. If a surgeon makes a mistake that results in injury to the patient, that surgeon is liable for medical malpractice. However, just because a surgeon makes a mistake does not mean that he or she has committed medical malpractice. In order to establish liability, you must show that the surgeon’s behavior fell below the medical standard of care and that you were harmed by the error. For example, if a surgeon leaves a small towel inside you after surgery but you never notice it or suffer any ill effects because of it, the doctor’s behavior fell below the medical standard of care but he or she did not commit malpractice because you were not harmed. If, however, a surgeon accidentally amputates your right arm when he or she should have amputated your left arm, the surgeon has engaged in malpractice because his or her behavior fell below the medical standard of care and caused you injury. Such a case would enable you to bring a medical malpractice claim against the surgeon.